A Gaelscoil (Irish pronunciation: [ˈɡeːl̪ˠsˠkɛlʲ]; plural: Gaelscoileanna) is an Irish-medium school in Ireland: the term refers especially to Irish-medium schools outside the Irish-speaking regions or Gaeltacht. Over 50,000 students attend Gaelscoileanna on the island of Ireland. A further over 13,000 students are receiving their primary and second level education through Irish in the Gaeltacht. Gaelscoileanna and Irish-medium schools in the Gaeltacht are supported and represented by Gaeloideachas and An Chomhairle um Oideachas Gaeltachta & Gaelscolaíochta or COGG in the Republic of Ireland and by Gaeloideachas and Comhairle na Gaelscolaíochta in Northern Ireland. County Dublin has over forty Irish language medium schools attended by over 13,000 pupils. Students in the Gaelscoileanna acquire the Irish language through language immersion, and study the standard curriculum through it. Gaelscoileanna, unlike English-medium schools, have the reputation of producing competent Irish speakers. 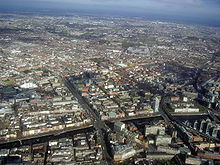 English-medium schools, in contrast, produce relatively few fluent Irish speakers, despite the Irish language being an obligatory subject in the Republic of Ireland in both primary and secondary school. This has been attributed in part to the lack of Irish-language immersion programs. Their success is due to effective (though limited) community support and an efficient administrative infrastructure. They are distinguished by being the product, not of state policy, but of a genuine community movement. Gaelscoileanna have undergone a striking expansion over the last few decades, although there are now concerns that rules limiting the founding of new schools is affecting the establishment of new Irish-medium education in areas where there is a competition amongst educational patrons. In 1972 there were only 11 such schools at primary level and five at secondary level in the Republic of Ireland. As of September 2017 there are 180 gaelscoileanna at primary level, attended by over 40,000 students, and 31 gaelcholáistí and 17 aonaid Ghaeilge (Irish language units) at secondary level, attended by over 11,000 students in non-Gaeltacht areas across Ireland. 35 of these primary schools, 2 of the postprimary schools and 4 of the postprimary units operated are in Northern Ireland. Additionally, some 4,000 children attend Irish-medium preschools or Naíonraí outside the Gaeltacht with around 1,000 children attending Naíonraí within the Gaeltacht. There is now at least one gaelscoil in every county in Ireland with over 40 in County Dublin; 30 in County Cork and 13 in County Antrim included. Gaelscoileanna have acquired a reputation for providing excellent academic results at a moderate cost. They have been described as a system of "positive social selection,” giving better than average access to tertiary education and the social and employment opportunities which follow. An analysis of "feeder" schools which send students on to tertiary level institutions shows that 22% of Irish-medium schools send all their students on to tertiary level, compared to 7% of English-medium schools. Supporters argue that the bilingualism resulting from early acquisition of another language is of general intellectual benefit and helps children to learn still other languages. Irish-language advocates of the immersion approach sometimes refer to studies showing that bilingual children have advantages over monoglot children in other subjects. 19,331 primary students attend 71 gaelscoileanna. 6,801 primary students attend 45 gaelscoileanna. 11,332 primary students attend 44 gaelscoileanna. 3,509 primary students attend 18 gaelscoileanna. At present over 11,000 students on the island of Ireland are receiving secondary education through Irish outside Gaeltacht areas. These include around 10,000 students in the Republic of Ireland. Two new second-level gaelscoileanna opened in Ireland in 2014: Coláiste Ghlór na Mara in Balbriggan and Gaelcholáiste an Phiarsaigh in Rathfarnham (both in County Dublin). Gaelcholáiste Charraig Uí Leighin opened in Carrigaline and Northern Ireland's second gaelcholáiste, Gaelcholáiste Dhoire, opened in Dungiven Castle in 2015. There are also campaigns running for several new gaelcholáistí in other areas. The function and future of the Gaelscoileanna in the Republic of Ireland will be affected by the 20-Year Strategy for the Irish Language 2010-2030, published in December 2010. This emphasises the importance of offering all children in primary schools in Ireland the opportunity to experience partial immersion in the formative years of primary education. It calls for primary teachers to have additional immersion classes to improve their competence in the language. This would involve teaching some subjects such as Mathematics and Science in Irish. Such a policy, if implemented effectively, may mean that the gaelscoileanna will no longer be the largest means of promoting Irish/English language bilingualism in schoolchildren. ^ "Retrieved 27 June 2011". Gaelscoileanna.ie. 22 February 1999. Archived from the original on 12 October 2013. Retrieved 2 May 2012. ^ "Language and Occupational Status: Linguistic Elitism in the Irish Labour Market". The Economic and Social Review, Vol. 40, No. 4, Winter, 2009. p. 446. ^ Bialystok and Hakuta (1994). In Other Words: The Science and Psychology of Second-Language Acquisition. New York: Basic Books. ISBN 0-465-03281-8.